One of our readers asked us how we are going to deal with TWO Sr. Mary Catherine of Jesus' in the monastery. We quickly found that it causes a lot of confusion! So tonight, we had a little cermony during which Sr. Mary Martin gave to Sr. Catherine her new name as a member of our monastery. There was a round of applause. It was obvious everyone was happy with Sister's new name. Now we have to REMEMBER it! An Ave for each mistake! 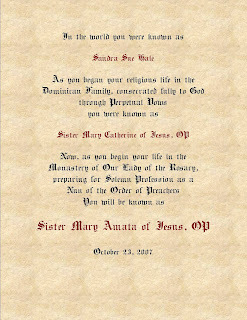 Below is a copy of the announcement Sr. Mary Amata was given. The edges were decoratively torn and it was mounted on dark red linen coverstock. The Cloister Gift Shoppe is Now Open for Business!